The prestige and reputation acquired by Asclepius as the major god of healing led to economic prosperity for his sanctuary, which made it possible to implement a large building programme in the 4th and 3rd Centuries BC to house his cult. The site included the Doric temple of Asclepius, the Tholos next to it which was the centre of the mystery cult and the Abaton. The Abaton was a porticoed building in which the sick, having purified themselves and offered sacrifices to the gods were required to go to sleep, so that the god could appear to them in a dream to cure them, or indicate to them the treatment to be followed. The counterpart of modern hypnosis perhaps? The discovery, during excavations, of a large number of medical instruments gives evidence that practical medical operations were also carried out in the sanctuary. Around the sacred precinct of Asclepius were temples dedicated to other deities (Artemis and Aphrodite), along with buildings to host the pilgrims, and athletic and music contests; the precinct included a stadium, palaestra, gymnasium, baths, odeon, and theatre. After three centuries of prosperity and world renown, the Asclepium was plundered by the Romans and pirates in the 1st Century BC. It enjoyed a second period of prosperity in the 2nd Century AD when new buildings were erected and old ones repaired. It, however, was once again pillaged, this time by the Goths and finally ceased to function when the ancient cults were banned by the Roman emperor Theodosius in the 5th Century AD as Christianity was adopted as the official state religion of the Roman empire. The ravages of time were completed by two major earthquakes in the 6th Century, and the sanctuary remained silent until the Archaeological Society uncovered its ensemble of monuments in the late 19th Century. The Museum houses the most important of the finds from the site. Inside are inscriptions with accounts of the miracles and cures of Asclepius, and an inscription containing the hymn to Apollo and Asclepius composed by Isyllos, an epic poet from Epidaurus in the 3rd Century BC. There are also inscriptions recording tenders for and the accounts of the building work. A showcase contains medical instruments found here. The second room houses mainly votive sculptures, while the third room contains reconstructions of parts of the temples, including casts of the sculptural decorations from the pediment of the temple of Asclepius and drawings, photographs and architectural elements to help the visitor gain an understanding of the form of the Tholos. On the slopes of Mt. Cynortium is the theatre of Epidaurus, the best preserved ancient theatre in Greece. Its construction was bound up with the process of therapy, and was thus not unconnected with the cult of Asclepius; it was believed that theatrical performances, by entertaining visitors to the sanctuary, speeded their cure. Originally, the theatre had a circular orchestra in the centre surrounded with a theatron or viewing area consisting of twelve wedges of 34 rows of steeply banked seats, giving a total capacity of 6,000. In the 2nd Century BC, the upper tier, with a further 22 rows of seats were added, providing seating for a total audience of 12,300. The first row of seats in both the upper and lower tier were for officials and shaped as thrones. The acting area was entered through Ionic gateways on the sides. The skene (or scene building), both dressing hut and stage backdrop, had two storeys and incorporated the proskenion (a colonnade that eventually became the stage). The theatre is still in use today for performances of ancient drama every summer as part of the Epidaurus festival. Its high quality acoustics are a result of the orchestra being slightly elliptical and not a perfect circle, with three distinct sound lines. A soft drizzle had started to fall as I wandered through the rows of seats. Ruli, my guide, called a young Greek boy to recite the opening lines of Homer as a demonstration of the acoustics. Later, more people came ‘on stage’. Some recited Shakespeare. Some sang. I seated myself on the top row of the theatre. It was all pretty magical. The soft rains, lush green hills blanketed with grey clouds, the theatrics, the rows of grey stone benches weathered over the centuries. And the aura of theatre which turns everything just a little bit bigger than life. I reached Nafplio in the late afternoon. It is a very picturesque town with castles tumbling down hills on one side, a beautiful harbour with a fairy tale tower in the middle, neo-Classical buildings in warm pastel colours and red tiled roofs, and old cobbled streets with brilliantly coloured bougainvillea cascading over balconies overhead, creating a tunnel of colour and greenery which every now and then breaks to let the golden sunlight pour into the lanes. Little cafes line the streets with chairs and tables on the side walks. Care for a Greek salad with some wine? Nafplio or Nauplia, chief town of the Prefecture of Argolida and one of the most attractive towns in Greece, takes its name from the mythical character Nauplius, son of Poseidon and Ammone. Nauplius’ son was the sage Palamides, who gave his name to the rocky hill on which the castle stands. The area was occupied during prehistoric times; in the 7th Century BC it came under Argos and was used as a harbour and naval base. It was deserted during Roman times, but fresh developments took place again under the Byzantines who held it till 1210. It then changed hands under various rulers for the next 500 years; the Franks, Venetians, Turks, Venetians and Turks again. After the liberation of Greece from the Turks, Nafplio was the country’s first capital (1829-1834) and the headquarters of Ioannis Capodistrias, its first governor. 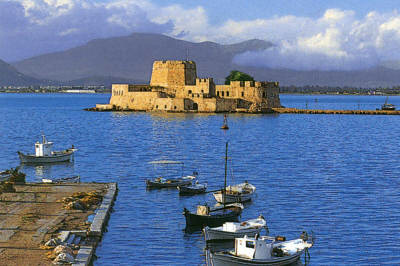 It was at Nafplio too that Othon, first king of Greece, landed in 1833. He was instrumental in moving the capital to Athens. Palamidi hill (216 meters) can be reached by motor road or by mounting the 857 steps on the side facing the sea. It was fortified in the second period of Venetian rule (17th Century). The castle has eight bastions, the gateway of each of which are decorated with the Venetian coat-of-arms showing the Lion of St. Mark. I couldn’t even dream of climbing those steps! It had been a long day. That, however, did not deter me from climbing up the Acronafplio, a lower hill to its west. Sections of the fortifications built in antiquity by the Byzantines, Franks and Venetians’ first period of rule still survive here. The views were just as magnificent. Facing the hills is the harbour of Nafplio with the pretty islet of Bourtzi. Originally called the island of Sts Theodore, the Bourtzi was fortified by the Venetians and a boom across the harbour mouth ran from it to the Acronafplio during their reign. The town of Nafplio is rich in historical monuments. Among the most notable are the first secondary school in Greece, the Parliament building in which the first National Assembly of the Greeks met in 1826, the Army Cadet School and the Ministry of the Army. Also of interest is the Venetian Church of St. Spyridon on the wall of which can still be seen the mark left by the bullet which killed Ioannis Capodistrias in 1831. In Syntagma Square stands the Archaeological Museum of Nafplio housed in old Venetian barracks. Steps, steps and more steps! I don’t believe I’ve ever climbed as many steps as I did in Greece. Everything seemed to be always on top of a rocky hill or mountain! Even side lanes were in actuality mere steps cut into the mountainside. This entry was posted in Exploring our World, Greece and tagged Classical Greece, Epidaurus, Epidaurus Festival, Greece's First Capital, Nafplio, Theatre of Epidaurus, Things to see in Greece by Rama Arya. Bookmark the permalink.